The die list currently consists over 400 dies ranging from small labels for specialized industries such as the IT and medical industries, to large format labels which are used in motor industry. 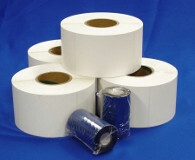 There are many different label materials that we supply depending on application. Thermal Transfer Premium and Direct Thermal primarily required for barcode printing. Semi gloss can be used for barcoding purposes, however it is mainly used for Flexo printing, providing an attractive finish to any colour printed label. Non tear labels such as polyprop, polyester and syntex are supplied for the harsher enviroment and where a longer life span for the label is required. A variety of adhesives are obtainable to comply with certain applications, for example, Deep Freeze, Ultra Deep Freeze, Hi Tack, Removable and Water Soluble. 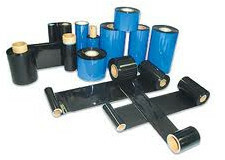 Leprechaun Labelling are suppliers of thermal transfer ribbons for most makes of thermal transfer printers. Depending on the material being printed on, the ribbon supplied will provide an optimum print quality, providing our customers with the assurance of good quality printing. Paper labels would normally be printed on with a wax ribbon. In cases where synthetic materials are being printed on, for example Polyprop or Polyester, a resin or wax resin ribbon would be appropriate. We are also official dealers of the Intermec, Datamax and Zebra range of products.